Frank M. Hundley has given up repairing and installing electronic hardware, and now finds more satisfaction in programming. Most of his programs were written to introduce his niece, Tiffany, to the world of computers. Children love to play games, and computer games arc no exception. Parents often feel that game-playing is a poor use for their expensive home computers—and sometimes they are right. But the public-domain and commercial software markets offer a wide variety of games, some of which make ample use of the editing and problem-solving features of the computer, giving kids a distinct advantage over their non-computer counter-parts. While every category of ST game offers several with the potential to provide hours of entertainment, some kinds of games have more long-term value for children than others. One type of game that immediately comes to mind as "valuable" is the skill-teaching game. These provide practice in a specific academic skill and can be helpful to children who need that special practice. Computer games of this kind can provide instant feedback. The "game" aspect of the package may serve as a motivator for reluctant students, but it will not mask the academic purpose of the program. The educational value of these programs is obvious to adults and children alike, but there are several other kinds of games in which learning is not a goal of the program, but rather a wonderful by-product. Games like Pac-Man do have relatively little value beyond entertainment. Strategies must be discovered, but, once learned, the gameplay is monotonous and one's prowess on succeeding levels is determined largely by the ability to move the joystick quickly; thinking is barely necessary. Kids love these mindless games, but a few quarters spent at your local arcade will often give them enough time with a game to become proficient at—and bored with—it. There are arcade games, however, which do have real value. Arcade games, like Time Bandits (MichTron) and DGDB (public domain), require the development of more sophisticated strategies. And when these games are played by two players, cooperation is much more likely to lead to success than is competition. Some games have an arcade component that grabs the child's interest, while other aspects of the same game will challegne thinking skills. Sundog (FTL) and Defender of the Crown (Cinemaware), for example, include arcadelike activities as well as challenging strategy. Word games, crossword puzzles and jumbled stories can reinforce spelling and word construction rules learned at school. Some of these games are easy enough for beginning readers, while others can challenge a college-educated adult. There are many such games for the ST in the public domain, and commercial games, such as Scrabble (Parker Brothers), are included in this group. With some games, children may not benefit from the learning value without a little nudge from their parents. Strategy games, simulations and adventure games are especially challenging to young thinkers; if they do not succeed quickly, children may abandon these programs and the learning potential they offer. Small interventions from parents can greatly increase a child's enjoyment of and benefit from a particular game. Also, because typical adventure games are designed for adults, it is a good idea to make a child's first game a family activity. By playing the game with the child, parents can observe the strategies the child is using and bring them to the child's attention. Parents or an older sibling can help the child consturct a map of a game's storyscape (see Figure 1), complete with hints as to what can be found at each location; a map can prove an invaluable aid in solving a game, and the process of creating one has some direct academic value. Such maps can be shared with friends, who may be able to expand them and add to the hints provided. Some games take better advantage than others of the unique featuers a computer affords. A few provide "construction kits" with which the user can design screens for use in the game. Even when the game itself is a mindless one, use of a construction kit can be a creative and thought-provoking task. Traditional games, such as board games and card games, are often converted for use on computers. There are versions of backgammon, Monopoly, chess and solitaire in the public domain. There are commercial versions of bridge, crazy eights and mah-jongg. Games such as these, whether in tabletop or software form, can be fascinating and stimulating. The computer versions typically offer the added advantage of instantaneous editing: saving a game at a specified point, returning to an earlier point in the play, testing possible moves before deciding on the final one, customizing the play pieces, etc. Conversions that exploit the special features of computer editing may well be worth the added investment over the traditional tabletop product. An only child will especially appreciate the ability of the computer to provide an opponent. 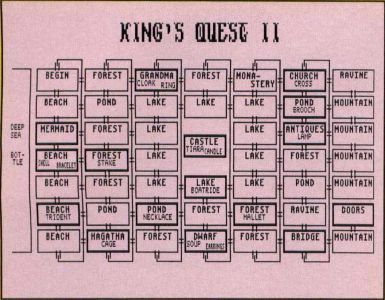 FIGURE 1 My seven-year-old son and I developed this storyscape map while on our way to solving King's Quest II (Sierra). FIGURE 2 A successful match on level one! FIGURE 3 The turtles are a match, but look out! A shark is coming, and you must ring the bell on the right edge of the screen or the match points will be lost. At this point in the shark's approach, its jaws are a faint outline around the turtle, and the player has enough time to ring the bell—if he moves quickly. FIGURE 4 On level three, the computer has presented a tadpole for matching, but the door (raft, in this case) that the player chose had a ship under it. In level three, the doors move until the player clicks the mouse to stop them. Each succeeding level in Seaside offers increasing difficulty. Even adults will find a challenge in levels three and four. One conversion that takes advantage of the special abilities of the ST can be found in this month's program: Tiffany's Seaside is a charming memory-matching game featuring various kinds of sea life hidden by numbered doors. Seaside contains many features that increase its value and interest, and it can be played by children of all ages (and also adults). The challenge on the upper levels is quite taxing, while a two-year-old who may not even understand the object of the game can enjoy simply knocking on the gates to see what's behind them. Targets for the mouse are large and easy to hit. 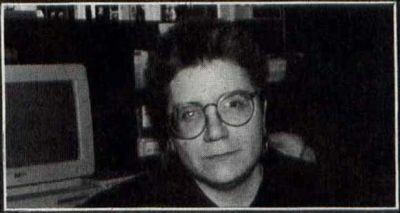 Seaside's programmer, Frank M. Hundley, has included many features that make the game more enjoyable to play than a simple box of matching cards. He provides auditory, visual and kinesthetic feedback to aid memory. The numbers on the doors help the child identify and remember matches, while the sounds made by the animals, as well as the charming animations, the delightful touches of humor and the threat of a random attack by a shark focus a child's attention. 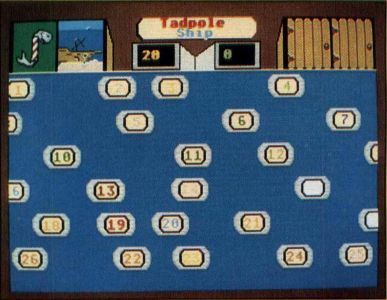 A fish at the left or right of the top portion of the screen indicates who's turn it is, and the fish claps when the child succeeds. The program, written in GFA BASIC, is on your ST-LOG disk in the file named SEASIDK.ARC. The program and associated files will occupy most of a single-sided disk. Follow the disk instructions to decompress the file, then copy all the files to a freshly formatted disk. Tiffany's Seaside will run from a hard drive and from a folder. If you do use a folder, be certain that all related files are in the same folder with SEASIDE.PRG. The program requires low resolution. Tiffany's Seaside is a children's memory-matching game with four progressively challenging levels. Like the old "Concentration" card game, the goal is to pair up matching objects hidden behind doors. The objects in this case are animated sea creatures. To play Seaside, you need a mouse and color monitor set to the low-resolution mode. When you start the game, press the mouse button to get past the introduction screen. The players will then be asked to enter their names on the keyboard. Any mistakes can be corrected by pressing the backspace key. This will give you a chance to start over. The next screen is an important one. You will be given a choice of playing level one only, level three only, levels one and two, levels three and four or all levels at once. To make your choice, put the mouse pointer in the appropriate box and press the left mouse button. Click the PLAY button the same way to move on. The last screen before actual play gives you three more choices. You can click on PLAY to start immediately, or if you feel you need some more information for the level you are about to play, click on INSTRUCTIONS. Clicking QUIT will terminate the game and return you to the desktop. When you enter level one (see Figure 2), you'll see a series of numbered doors. At the top, middle of the screen is a scoreboard, which also keeps tracks of the turns. Player one starts by knocking on a door. Put the fist-shaped mouse pointer on the door and press the button to knock. The door will open and reveal a creature. Now you knock on one more door. If you find the matching creature, you score ten points and retain your turn. If not, the mouse changes hands and it is the second player's turn. 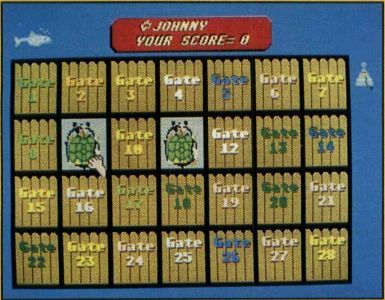 All creatures are worth ten points, except the Shark, which is worth 20 points, and the Treasure Chest, which can be worth zero, ten, 20 or 30 points. When you match the Treasure Chest, watch it open on the screen to reveal your booty. Occasionally, after you make a successful match, a Shark may try to rob you of your points (see Figure 3). When you see one of these Shark attacks, the only way to save your points is to ring the Shark-Alert bell on the right side of the screen. Put the pointer on the bell and press the button. If you sound the alert in time, the Shark disappears. If not, the bell won't ring and you lose the points from that match—as well as your turn. The matching continues on level two, but now the creature that you have to locate will be picked for you. At the beginning of each turn, a creature will appear from behind a special door on the top of the screen. You knock on one door, only this time to find a creature that matches. A different creature will be picked for each turn. You still have to keep an eye out for the Shark and a new addition, the Ghost. After any turn, a Ghost sprite may appear at the door that was just opened. It will travel along the doorways until it eventually stops and disappears in front of another door. This routine signals that the creatures behind the two respective doors have traded places. The creature that was behind the door where the Ghost started its journey is now behind the door where the Ghost stopped, and vice versa. The third level (see Figure 4) plays just like the second level, except the Ghost and the Shark attacks are absent. The increase in challenge comes from the doors, which are now all moving. To pick a door on level three, press and release the left mouse button once. This will temporarily stop the movement of the doors and bring the hand pointer into view. At this point you can go ahead and knock on a door. If you find that the door you want is not the screen, you can press the right mouse button to start the doors moving again. You can also wait a few seconds and the doors will start moving again on their own. After a turn, the doors resume moving automatically. 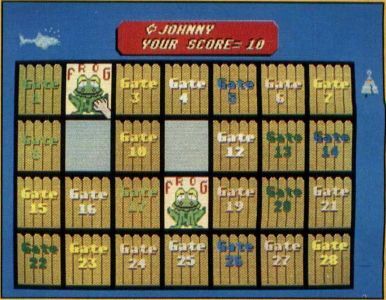 On the fourth and final level, the doors still move, but, as in the first level, you knock on two doors to make a match. At the start of the game, you see two closed doors on the top of each player's side of the screen. These will open and show your picks as you make two attempts to match a creature. With the doors always moving, finding the location of both creatures can be quite difficult, but since it is the last level, the Ghost is back to add to the challenge even further. After a turn, he may be seen traveling between the two doors at the top of the screen. This means the creatures behind the last two doors chosen have exchanged positions. Tiffany's Seaside has been used by more than 200 preschool through second-grade students at Creative Discovery School in Champaign, Illinois, and at Leal Elementary School in Urbana, Illinois. It is among the favorites most often cited by these students, and we know your child (and you!) will also enjoy it tremendously. D.A. Brumleve, M.A., is involved with children and computers in a variety of ways. The mother of five children, ages 2 to 10, she serves as the adult facilitator of the Children's ST Users' Group in Urbana, Illinois. An avid programmer, she has developed a beginner's course in GFA BASIC and is the author of PreSchool KidProgs (MichTron) and numerous freely distributed programs for young ST users. Her daughter, Catherine, is a student at Creative Discovery School.